I know this has nothing to do with books but I unearthed it on the weekend and felt it’d be perfect to share with you. 1. 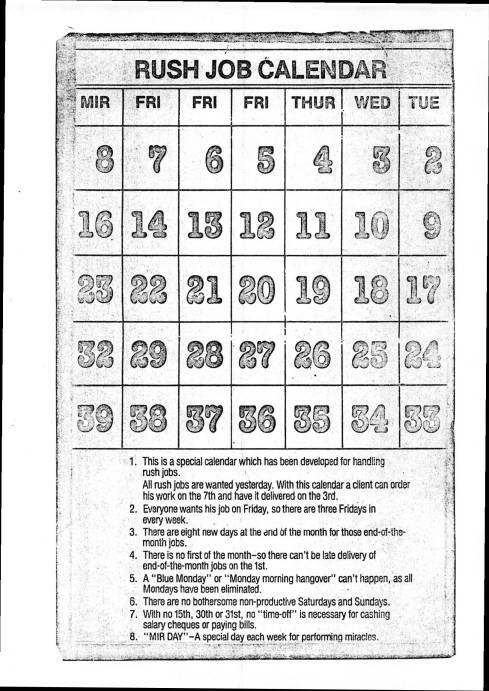 This is a special calendar which has been developed for handling rush jobs. All rush jobs are wanted yesterday. With this calendar a client can order his work on the 7th and have it delivered on the 3rd. 2. Everyone wants his job on Friday, so there are three Fridays in every week. 3. There are eight new days at the end of the month for those end-of-the-month jobs. 4. There is no first of the month – so there can’t be late delivery of end-of-the-month jobs on the 1st. 5. A “Blue Monday” or “Monday morning hangover” can’t happen, as all Mondays have been eliminated. 6. There are no bothersome non-productive Saturdays and Sundays. 7. With no 15th, 30, or 31st, no “time-off” is necessary for cashing salary cheques or paying bills. 8. “MIR DAY” – A special day each week for performing miracles. Apollo 13 is the story of a moon walk that turned into a rescue mission. It was written in conjunction with one of the men who was on that flight. It tells the story from several viewpoints. The astronauts, Jim Lovell’s wife, Marilyn, and various parts of the ground crew. It also gives you Jim Lovell’s background and shows us how driven he was and how he was meant to be in space. I was too young to remember this mission so when the movie came out a few years ago with Tom Hanks as Jim Lovell I watched it with bated breath as I had no idea how it finished. I had not done any research before the movie as I wanted to be surprised and I was very surprised. I loved the movie so much as it gave a real insight into the problems that could occur in space missions. When I saw the book I knew I just had to buy it to read. And to the book. Just fabulous!! I’m one of those people who have read science fiction most of their lives hoping to go into space one day. I know I never will, but I really want to go to the moon. This must be genetic as my grandmother always wanted to be the oldest person on the moon, she would have even considered having her ashes scattered there. When Jim Lovell is looking at the moon through the window of the space craft I cried. I watched Marilyn’s tension as she followed the rescue mission and was totally amazed by her strength, especially when she told the media they couldn’t park their equipment on her property and if they had a problem with that they could discuss it with her husband who would be home that Friday – all while they were totally uncertain if Apollo 13 would land safely. Reading the dedication of the ground crew to bringing Apollo 13’s crew back to earth safely. Just awe inspiring. Reading about the day to day problems with just being in space. Gaining an understanding of the qualities needed to be a spaceman. Beginning to understand how hard it is to relay instructions to the aircrew. Understand some of the parts of the movie such as why only one person spoke to the aircrew. I can’t recommend this book enough. I suspect my family will want to read it and then I’ll list it for sale on the website. I have just managed to buy a VHS copy of the movie and will be including that in the sale if it is a suitable quality, I’ll have to watch it first to check it has no problems.